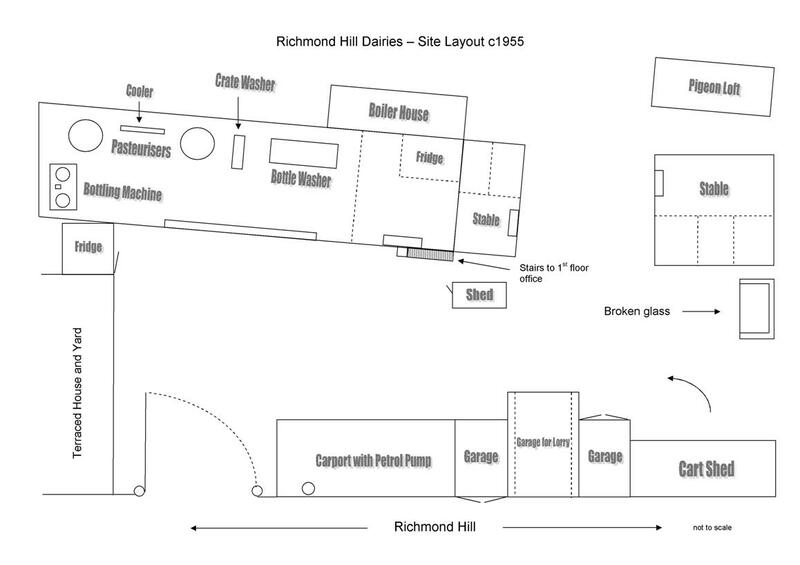 Richmond Hill Dairies was sited in a yard between two rows of terraced houses just beyond the Methodist Church on the left hand side of Richmond Hill Pemberton. At the time Richmond Hill had a junction with Ormskirk Road just below the Queens Cinema and the police station. The site entrance was a set of double gates leading directly from the road which was unadopted and prone to pot-holing. From the gates the site extended perhaps thirty yards to the right along Richmond Hill and fifty yards to the rear boundary with St John's church yard. The site also extended for some distance behind the terraced houses to the left of the gates. The dairy was housed in a high roofed building set back 10 yards from the entrance gates with double doors directly facing the gates. The right hand quarter of the building was two storeys with a single door at floor level and external stairs leading to an office on the first floor. The greater part of the building to the left was single storey with double height ceiling and housed all the equipment for washing crates and bottles, pasteurising the milk, cooling and bottling it. There were two walk-in refrigerators the larger one built as an extension to the main building to the left of the double doors and the second one at the back of the small room below the office on the right hand side of the building. At the rear and attached to the main building was a boiler house with a large coke fired boiler to provide steam for pasteurising the milk and washing and sterilising milk bottles, crates, churns and other equipment. I'm sure this boiler had a power output equivalent to that of a main line steam train, it required feeding at regular intervals during the day and was a very pleasant place to be in cold weather. To the right of the gate was a covered area which housed a hand cranked petrol pump and was used to garage the small Austin A40 pick-up truck. Further along was a wooden garage whose doors opened directly onto Richmond Hill, in the early fifties this was leased to a local businessman and housed a very nice dark green Rover 75 registration number JP 7676, this could have been Alf Swift the local pharmacist who had shops at Union Bridge and Orrell Post. The site had two stables with room for four horses, one attached to the right hand side of the main building and the other on the opposite side of the passage leading to the rear of the building. The extreme right hand side of the dairy site sloped towards Cannell's joinery works at the bottom of Richmond Hill. Down the slope were a number of cart sheds where the horse drawn carts were stored when not in use to protect them from the weather. It was also home to a bunker for broken glass an inevitable bi-product of the dairy industry. To the right of the main building at the bottom of the steps to the office was a shed for keeping miscellaneous items for the smooth running of the business. This included an extension from the main telephone in the office above which also had a large double gong extension bell on the outside wall of the building above the door. The telephone number was Pemberton 82367.